From Practicing Standing 17 (84 minutes off and on, before and during the lunar eclipse [and chatting]). January 31, 2018. Svalbard Sailing Club. 1. I don’t want to write a memoir of my experiences in the Far North. For one reason, I do not think I am done with it – this is what my northern friends say to me whenever they send me off. I am not done with Svalbard. I am not done with the North. For another reason, I have been thrown by the Arctic. Thrown in such a way that each day I ruminate on all these many thoughts, and feelings and ideas, and my experiences dance in my head and my heart and I don’t really want to write of clichés and tourism. 2. I want to write of my love affair with this other place I never imagined feeling so drawn or connected to. Like all love affairs, it is both exhilarating and self-revealing in the most humbling of ways. I want this feeling to last forever. From Practicing Standing, Practicing variously 24 (just long enough, towards Mine 2b, Julenissegruva [a moment with Andromeda]). February 11, 2018. Galleri Svalbard. 3. My art centres on collection, endurance, and methods of amassing and interpreting data. I am attracted to rituals of collection, enumeration, and analysis. While I work in a range of media within a conceptual practice, I tend to make the most use of photography and video throughout my practice. 4. For several years I have been pre-occupied with a set of astronomy-based projects that emerged from seeing Saturn through a telescope for the first time in 2010: an astonishing personal experience raising questions about the incomprehensible scale of the universe and our ability to make sense of that scale. This has become, for me, a preoccupation with time and its representation. 5. In June 2017 I attended the Arctic Circle Summer Solstice expedition. 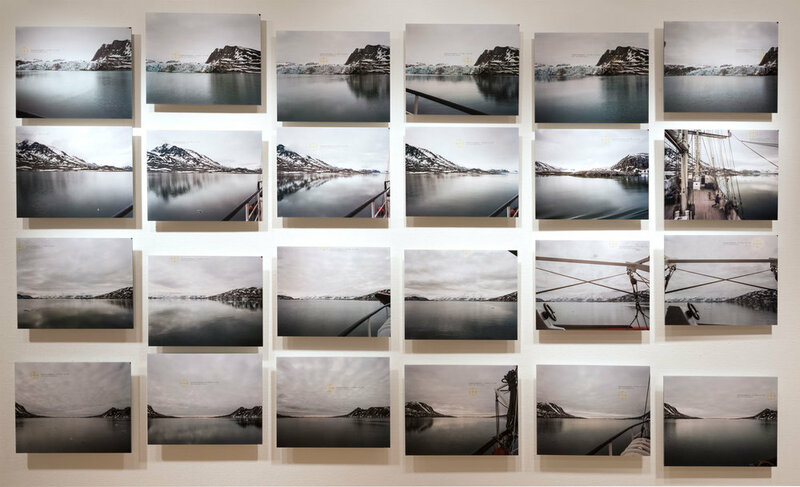 With thirty-three artists and scientists, including armed guides, plus the crew of the tall ship Antigua, I sailed around the west coast of Svalbard, north of Norway, within the Arctic Circle, landing each day within one fjord after another. With this many people in close quarters, with the midnight sun shining brightly, with the constant overstimulation of both people and place, I was out of my mind and completely exhausted. 6. In A Sedimentation of the Mind: Earth Projects, Robert Smithson opens with the idea that “One’s mind and the earth are in a constant state of erosion, mental rivers wear away abstract banks, brain waves undermine cliffs of thought, ideas decompose into stones of unknowing, and conceptual crystallizations break apart into deposits of gritty reason.” Smithson’s narrative prose was very helpful to me over these many months, working through thousands of images and dozens of hours of video in my process of making exhibitions, talks, and publications, all from this experience of being on a boat sailing around the Arctic, overstimulated and exhausted. 7. I woke to a bright blue glacier and wondered, would I climb it? What is Majestic? (Fridtjofbreen-Fridtjof Glacier, 77°46'6"N, 014°34'5"E, June 22, 2017), Chromogenic photograph, 72x26", 2017. 8. We reached close to 80° North, but the sea ice stopped us from going farther. There, at 79.56°, we wandered, travelling fewer miles each day atop the spinning planet, travelling less than anyone farther south. We moored to an ice floe overnight; it floated us around a three-mile circle. We scurried up and down snowy moraines, across rocky beaches, and very carefully through meadows of artic flora. We grappled with our complicity – some more than others, of course. One artist had a breakdown mid-voyage, unsure what on earth, exactly, they could possibly be doing up there, having realised all their camera gear was extracted from the earth, possibly by child slaves. 9. I set out to track the midnight sun but was foiled. It was mostly foggy or cloudy. Although I carried out a 24-hour large format camera shooting marathon, I could not connect with the analytical methods that characterise my broader work. Working more intuitively, and in particular with landscape imagery on subject matter that is visually spectacular, was challenging. It is not my primary goal as an artist to make beautiful photographs. They Went on Forever (Recherchebreen-Research Glacier, 77°29'6"N, 014°39'3"E, June 22, 2017). Chromogenic photograph, 72x26", 2017. 10. I couldn’t land; I couldn’t settle. I felt aimless and disassociated. I regretted not planning any performance work, or having usable props, but I regretted even more having any project at all, when what I really wished I could do was just stand and stare. And so my plans could not matter – only the lines, the boundaries, the edges, the land, the ice, the sea, the air, the atmosphere, the companionship, and the exercise. 11. Landscape images carry the burden of ideologies of hinterland, settlement, displacement, and human intervention. We collectively seek peaceful and quiet experiences from the land, and in part fulfill such desires through artistic representations. I Caused a Landslide (Vårsolbukta-Little Auk Bight. 77°45'3"N, 014°20'2"E, June 21, 2017). Chromogenic photograph, 72x26", 2017. BELOW: A False Sense of Isolation (Ytre Norskøya-Outer Norway Island, 79°51'44"N, 011°26'8"E, June 17, 2017) Chromogenic photograph, 72x26", 2017. 12. Robert Smithson continues. He wrote, “Vast moving faculties occur in this …miasma, and they move in the most physical way.” These movements, he says, they, “crush the landscape of logic under glacial reveries…” embedded in the sediment of the mind. That sediment contains limits and boundaries that evade the rational order, and he describes the difference between an experience, and its re-presentation. This was my artistic state for the rest of 2017, navigating the combination and assembly of all these possibilities, and impossibilities, of making an art exhibition. I Wanted to Console the Ice (Northern Fjortende Julibukta-14th of July Glacier, 79°07'2"N, 011°51'1"E, June 13, 2017) Chromogenic photograph, 72x26", 2017. 14. I spent the cold autumn in Saskatchewan walking everywhere, to develop the strength to walk up and down the Longyear Valley from the town site to Galleri Svalbard. There, in Longyearbyen, where I was invited to an artist residency in January and February of 2018 – from the last of Polar Night until the sunrise. I learned to use a rifle. Still exhausted, I could not wait to return, this time to silence, solitude, and a sense of isolation. I needed to go as far from humanity as I could and still have high-speed internet. Views beyond the Longyear Glacier up to Platåbreen during polar night in Longyearbyen, from the residence entrance in Nybyen. 15. I often wonder what it means to be up north, especially for those of us who were not born there. We visitors, these days, we must be rich, and we must still fancy ourselves as explorers, expeditioners, settlers. On Antigua a shipmate reminded me that for all the feeling of adventure, we artists and scientists were quite safe, aboard a powered vessel with three square meals a day, heated berths, and a fully stocked bar. Visiting Longyearbyen during the dark night provided a different sense of the community there, comprised of an international collection of bureaucrats, scientists, service workers, students, adventure guides, taxi drivers, and a few dozen long-resident families with connections to the now almost defunct coal mining industry on the Archipelago. The population turns over almost completely every four or five years, and the precarity of the place is unavoidably obvious – be that because of the shortage of housing (due to a variety of factors including avalanche threat, permafrost melt, or the short-term rental of units to tourists), the close-to 100th straight month of warmer than normal temperatures, the massive growth in tourism, or the strategic global-political location of the place within the framework of the Svalbard Treaty. Longer-term residents can be difficult to befriend, because visitors are demanding of knowledge and survival needs, and because it is heartbreaking to make and lose friends who come and go with such frequency. 16. My goal as an artist in residence at Galleri Svalbard during polar night was, frankly, to experience a certain degree of underachievement during the final weeks of darkness. Within days of my arrival, and my discovery that my studio gave me easy access to the flat-top roof overlooking the valley, mountains, and two glaciers, I began the Practicing Standing series – practices to ground and put off balance. In contrast to the constant sailing and landing of the summer residency, the rooftop allowed me to, literally, stand still and to observe and reflect within one environment. I conducted thirty-two standing sessions for a total of almost twenty-four hours. Practicing Standing and Sitting 25 (25 minutes, morning coffee in between civil dawn and dusk). February 13, 2018. Galleri Svalbard. 17. It is a day called Monday. It is so dark and quiet. I will likely stand, stitch, read, write, listen to the radiator, scout for locations, learn about the great (and not so great) history of polar expeditions from this cold and icy frigid dark and blueing watery mountainous place. I could not have gone farther. Solitude. Desire. It is a day called Monday. Day 1, Instructions for Performance: Svalbard Poetry Walking Tour, given by Nic James Wilson. Svalbard Church. “Feel Free”, by Nick Laird. Svalbard Poetry Walking Tour, instructions for performance given by Nic Wilson (Day 01: Feel Free, by Nick Laird). January 29, 2018. Svalbard Church. Svalbard Poetry Walking Tour, instructions for performance given by Nic Wilson (Day 02: Short Talk on Where to Travel by Anne Cason [sic]). January 30, 2018. North Pole Expedition Museum. Svalbard Poetry Walking Tour, instructions for performance given by Nic Wilson (Day 03: Diving Into the Wreck, by Adrienne Rich). January 31, 2018. Within sight of Gammelkaia Observation Deck; during the lunar eclipse. Svalbard Poetry Walking Tour, instructions for performance given by Nic Wilson (Day 04: Body, Remember...by Constantine Cavafy). February 1, 2018. Monument to an Unknown Miner. 18. Experiencing being on such an unusual part of the planet, so far north, where the sun does not rise or set for months at a time, was existentially and phenomenologically gripping. I have never felt more a part of the solar system. The cosmos is unbearably profound, unimaginably vast, and outside the reach of human trauma and drama. Last light on Platåbreen at the start of the new dark season in November, 2018, with the Polar Permaculture greenhouse. View from Larsbreen towards Longyearbyen and beyond, February 16, 2018, 11:30am. 20. As the light slowly took over the valley I often heard the distant arctic foxes barking on the mountainsides. One afternoon during civil dawn my friend Kanerva Karpo, a Finnish graphic designer who moved to Longyearbyen shortly before my winter arrival, spent the day with me in studio. When a fox started yapping it was so close I could finally see it – agitated while approaching and retreating from a small group of absolutely indifferent Svalbard reindeer. The reindeer ignored it completely. They were still, I suppose, in their state of arctic resignation, conserving energy until the snow melted and the tundra began its summer regrowth, not at all bothered to trot by a scandalised fox. I think in those days before the sunlight actually struck the town, Kanerva and I must have felt a bit channeled by these animal companions. Arctic Fox, on Gruvefjellet, February 2018. 21. There are reasons people venture to the farthest reaches of this planet, reasons people leave their homes to locate themselves in a place like Longyearbyen, with its feeling of otherworldliness and small-town social quirks. Baudelaire captures this desire: of course we should all always be happier somewhere else… Anywhere, Anywhere, so long as it be out of this world! Installation, Galleri Svalbard, Longyearbyen, November-December 2018. 23. I Set Out to track the Sun is a solo exhibition that was mounted at Gallery Svalbard in November and December 2018 – at the start of the dark season. (View the Exhibition Brochure with gallery text by Rebecca Huxley). I Set Out to Track the Sun, seen installed (above) and as slideshow detail (below). This body of work revolves around tracking the un-setting sun. Resulting from a 24hr-shooting marathon aboard the barquentine tall ship Antigua on the western coast of Svalbard. I Set Out to Track the Sun imagines where the sun should be in each of the four compass directions. ABOVE: As If To Track The Sun at Galleri Svalbard, Longyearbyen, November-December 2018. With thanks to Robert Hengeveld. 23. In June I will go to an other north, a residency with the Klondike Institute of Arts and Culture in Dawson City, Yukon Territories. There is more to do. 24. In thanks to Art North’s Editor, Ian McKay, I want to make mention of the tendrils of camaraderie that spread around the globe above and below 60° N, and give thanks to be a part of sharing the flow. (Note: Most of this text has been adapted from several iterations of writing that I have presented in a variety of formats over the past three years, from residency and grant applications and my personal notebooks, to conference presentations and artist talks, magazines, blog posts, and my website… as I continue to ruminate upon and pine for the Arctic). All images, videos and text: © Risa Horowitz, 2019. All rights reserved (except Exhibition Brochure © 2018 Risa Horowitz & Rebecca Huxley, in partnership with Galleri Svalbard). The Author gratefully acknowledges the generous assistance of both the Saskatchewan Arts Board and the Canada Council for the Arts.